The Kelpie came into being last century because Australian sheep farmers needed a special type of dog that could work sheep on the vast Outback properties, and under harsh conditions. This was a result of the various breeds of sheep dogs from Europe and the UK having proven too heavily coated to cope with the severe Australian climate. This wonderful breed came from two black and tan, short-coated and pointed-eared Collies imported in the 1860s. The Australian Kelpie has been exported to Russia, Norway, Sweden, Denmark, the UK, the USA, South America, South Africa, New Zealand, Germany and the Netherlands. These dogs have been successfully used to manage a variety of stock, including reindeer, goats, and cattle. Kelpies have excelled in the areas of obedience, agility and tracking. They have participated in pet therapy programmes and have even been utilised as guide dogs for the blind. The finest characteristic of the Kelpie, however, is its irresistible personality. The breed is extremely alert and eager and highly intelligent. As a companion animal, the Kelpie has few equals. Obedience provides a great way of getting to know and share the needs of this highly intelligent dog. 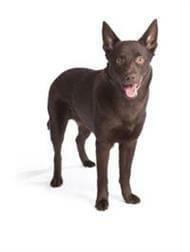 The Kelpie is free from most inherited diseases and is a relatively low maintenance dog. The breed is quickly house-trained and is an easy dog to feed – eating almost anything it is given. It needs about the same amount of exercise as other healthy young dogs. If you are thinking of buying a Kelpie pup make sure that you are prepared to commit to the amount of time it deserves, as this breed will want to be your constant companion. Take time to learn about the breed, in particular its care and training requirements. It is important to ensure that your yard is fully fenced.